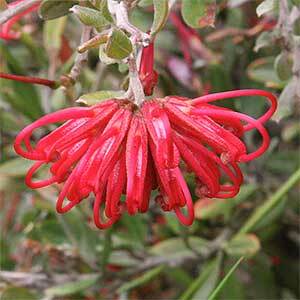 With brilliant red spidery flowers Grevillea speciosa is long flowering and easy care. Being a naturally dense growing plant it provides an excellent habitat for the smaller nectar seeking birds as hey can hide away in the foliage. Another good feature is the dense growth also make it suited as a low hedge or barrier plant. As it spreads, nothing much will grow beneath it so its a great filler for difficult to maintain spaces. In a well drained humus rich soil this is an easy care plant. We do suggest digging in some well rotted compost and aged co manure before planting. Best tip pruned after flowering to maintain a dense bushy habit. Flowering time – Spring to summer although in some climates almost year round. Foliage – Small mid green and elliptical.